The 2oz 2018 Queen’s Beasts Unicorn silver coin will be the eye-catching highlight of your collection. The fourth release in the very successful Queen’s Beasts collection from the UK Royal Mint, this beautiful limited edition .9999 silver coin is supplied in a sealed capsule with a certificate of authentication. The Royal Mint's outstanding Queen's Beasts Series takes its inspiration from ten majestic statues that represent the mythical creatures associated with the various strands of the monarchy's lineage. These imposing beasts were created by sculptor James Woodward for the coronation of HM Queen Elizabeth II in 1953. Royal Mint artist Jody Clark based his designs on the famous statues and the Queen's Beasts Lion of England silver coin made its debut in 2016. An immediate success, the coin was followed by the Griffin of Edward III (2016) and the Red Dragon of Wales (2017). The exceptional 2018 2oz Silver Unicorn is certain to be just as successful. Interestingly, the launch of the Queen's Beasts series also marked the debut of the Mint's first 2oz silver coin. The impressive 2018 2oz Queen's Beasts Unicorn silver coin is struck from two troy ounces of .9999 fine silver. The beautifully detailed reverse design by Jody Clark depicts a stylised unicorn based on James Woodford's original sculpture. Two unicorns were chosen as supporters of the Royal Arms of Scotland at the end of the 16th century. When the English crown passed to Scotland's James IV he became James I of England. As supporters for his Royal Arms he chose one of his own unicorns of Scotland and a crowned Lion of England. The unicorn bears a shield featuring the lion rampant that is the Royal Arms of Scotland. The coin's obverse features the fifth coinage portrait of Her Majesty, also by Jody Clark. Choose the 2018 2oz Queen's Beasts Silver Unicorn and add a unique coin with historical connotations to your collection. These exceptional coins also make great gifts, and like all legal tender British currency, they are CGT (Capital Gains Tax) exempt. 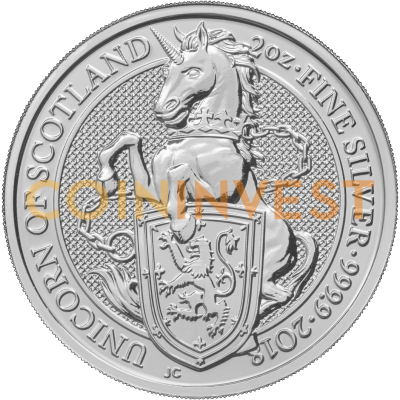 Buy the 2018 2oz Queen's Beasts Silver Unicorn coin with coininvest.com for fast, insured shipping. Check if we have previous Queen's Beasts gold and silver coins in stock if you wish to fill any gaps in your collection. Extremely well detailed coin! Queens beast is a must either collecting or stacking!